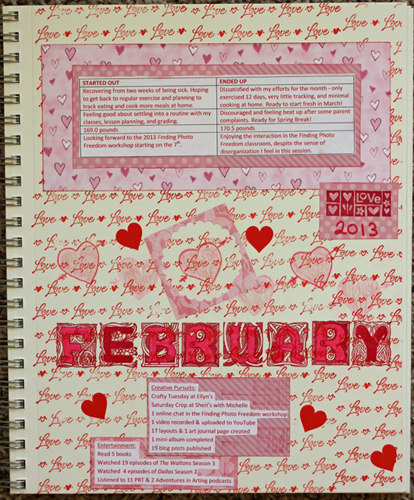 I had so much fun creating my January Art Journal Page that I decided to do another one for February. I really want to use my stamps more, so I pulled a large background stamp, a set of alphabets, and a few smaller stamps to work with for this page. I chose a love theme and red and pink inks and markers. I have to admit that it turned out a little "busier" than I had planned! I included the same journaling format as last month with a look at how my month Started Out and Ended Up. I also included stats for Entertainment and Creative Pursuits. Looking back over this monthly review, I think I need to make a rule that I can't spend time in my craft room until after I exercise - maybe that will help the number of days I exercised not be so much lower than the number of layouts, blog posts, mini-albums, and art journal pages I created! maybe we need to start our crafty tuesdays off with a workout session? Then again, if we do that maybe nobody will come, LOL. Love your art journal. I like how you sum everything up and the background stamp is really nice. This is going to be such a fun review album - I think the busier page fits this busier month. Twelve days of exercising is almost 50% of the months as it is such a short month! Your lovely page is as full as your creative life! I am so admiring of what you fit into your days … Five minutes of moving every hour of the day would mount up without needing a big block of time?